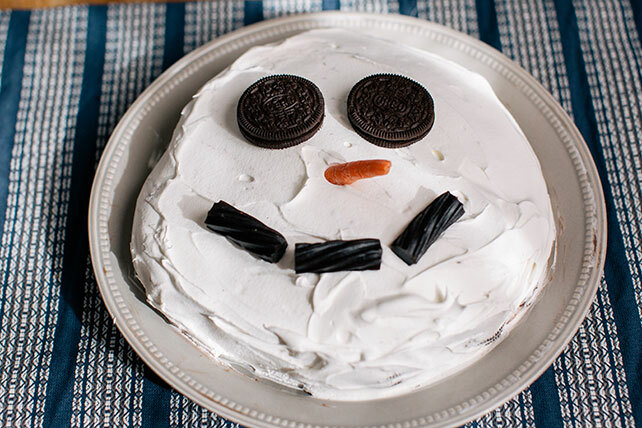 Make the little ones smile from ear to ear with this Cookies & Cream Snowman Dessert recipe. Two eyes made out of coal would be more authentic, but we chose to decorate our Cookies & Cream Snowman Dessert with tasty chocolate sandwich cookies instead. Uncover dessert. Invert onto serving plate; remove plastic wrap. Frost dessert with COOL WHIP. Add remaining cookies for the eyes, carrot for the nose and licorice pieces for the mouth. Prepare using JELL-O Chocolate Fudge Flavor Instant Pudding.